The wonderful Ackis Recipe List has kept me on top of my game and I finally got around to documenting how far I've come with my professions. 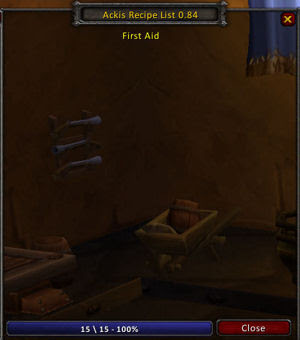 We'll start with the easiest and best looking list of the four - first aid - 100%! 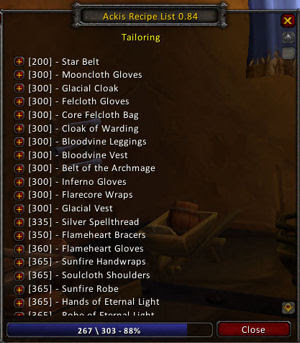 As you can see, I'm at 88% of all tailoring recipes. However, this doesn't take into account that there are recipes I will not ever be able to learn (of course, without switching to exalted Aldor). 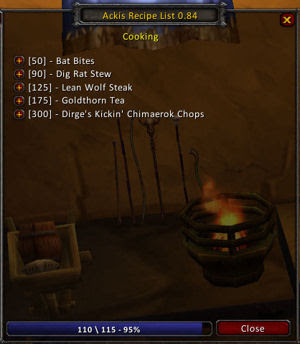 There's a few recipes I still need to search down - some from Zul'Gurub rep, one in Karazhan still, and then just random other recipes from around the world. I still need to keep on raiding Knot Thimblejack's Cache and hope for some patterns from there as well. 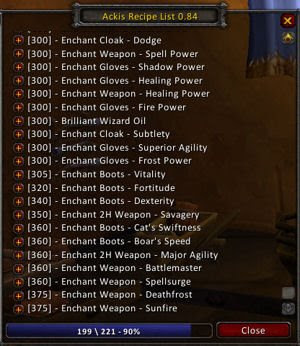 For enchanting, I'm at 199/221 recipes or 90%. A few are from the old world, Ahn'Qiraj which no one raids any more and some others from Zul'Gurub reputation. And then there's just a ton that drop in Outland instances which I really don't want to farm, but will at some point. And the last ones on the list are really expensive rare drops which I'm still saving up for. So there you have it. Not too shabby - 88% tailoring, 90% enchanting. Cooking should be close to finished soon and first aid is done. Next...on to pet completion!